Sir ‘Enry the Ninth of Sidewinder, originally uploaded by Mean and Pinchy. 2. What is the water volume or tank size? It hold about 2 to 21/2 liters of water. 4. Have you tested for Ammonia, Nitrite and Nitrate? What were the results? Nothing everything in the water was normal. 5. Have you tested for pH, kh and gh? What were the results? I am unsure. 7. How often do you change your tank water? How much water do you replace at a time? I change the new water one a week and I usually change all of it. 9. How often do you feed your betta? What types of food are you using? How much are you feeding each time? I feed him two times a day once in the morning and once at night. I feed him beta food from wall-mart the brand is Wardley’s. 10. What water additives and medications are you using? Remember to include water conditioners or salt if you’re using them. I am not using anything i just clean the tank with hot water and then cool everything down with cold. My water here has a lot of iron so I use store bought jugs to change his water. He is lying on his side at the bottom of the tank. He looks sick in a way he looks as if he is loosing color and when he goes to swim to the top of the tank he swims sideways. Please help me I don’t want him to suffer. What should I do? A: Thanks for taking the time to fill out my questionnaire before writing in. It always helps me a lot. From the information you provided there wasn’t any one issue that really sticks out as being a problem. The water temperature, cleaning regimen and water chemistry all seem fine. The fact that he is loosing color and laying on the bottom of the tank concerns me though, as it sounds more serious than simple constipation, which can sometimes cause the sideways swimming. It is possible that Nemo has acquired some sort of infection, possibly in his swim bladder which can also cause the fish to whirl about or swim sideways. Since we don’t know the nature of the illness (could be bacterial, viral, parasitic or environmental) it is impossible to know exactly what to treat Nemo with. I suggest doing what you can to reduce stress and create an environment that fosters good health. Increase the water changes, making sure he isn’t exposed to ammonia. Keep his water warm (78 F, where you have it is perfect) and make sure it is stable, not dropping by more than a couple degrees at night. Keep his food fresh. It is a good sign that he is still eating but keep in mind that fish food looses its vitamins once open. If your fish food is older than 3 months, consider tossing it and getting a fresh package. I don’t like to jump too quickly to medicating my fish as many of the commercial fish medicines are pretty potent, but if you suspect an internal infection you might want to consider a broad-spectrum antibiotic for Nemo like Triple Sulfa. Before medicating your fish, consider it carefully as it can cause additional stress. As with any antibiotic, follow the directions on the package carefully. 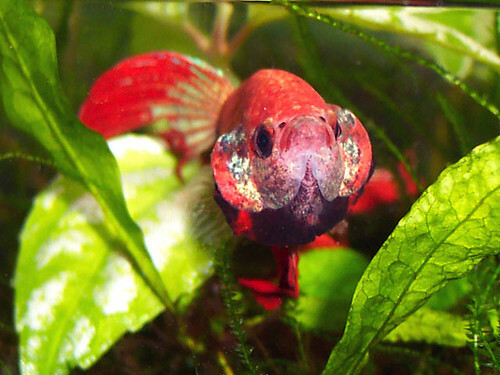 The symptoms that Nemo is showing are very common with many Betta diseases so monitor him carefully for additional symptoms that may help you to better narrow down the cause. Well if the person isn’t using any water conditioners could the fish be getting sick from chlorine? HELP! My female crowntail suddenly developed a white patch on her eye. I was searching the web, bout couldn’t find answers. I checked on her to find that the patch has become a ring in the middle of her cornea. She doesn’t seem sick and is very healthy and none of the other fish in the tank seem to be affected. Any help? I have a male betta doing the swimming on his side thing at the top of the tank.. He was fully active until a couple days ago.. He seemed to still be eating last night. He is in a 3 to 5 gal aquarium with 3 neons an algae eater and a ghost shrimp (haven’t seen him in a while so not too sure about the shrimp) The temp is 76 I am going to be getting a new heater today as I am not sure if the one I got is working. I do have a filter and the other fish seem to be doing fine.. Do they recover if it is a swim bladder problem.. And should I leave him in the same tank or would it increase his stress if I moved him.. He is so beautiful and has been thriving in his tank for a month… I hate to lose him so soon..
help! So I changed my Betta’s water two days ago, and i used a betta water conditioner from a pet store that my friend gave me. But now my little guy can’t swim down, and when he tries, he keeps floating up to the top. He was never doing this before i changed his water. I decided to change all of his water now but he’s still stuck swimming on just the top. He doesn’t look like he is turning sideways, but I don’t know what to do. please help my fish, I love him very much!